You are here: Home » RESOURCES » Coaching 101 Minute » Is Your Mind Full or Are You Mindful? Mindfulness describes a state of mind in which you observe thoughts, emotions or actions without judgment, as they pass through awareness. 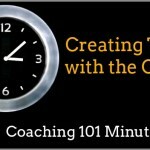 Mindfulness meditations or techniques can help a coach enter the right frame of mind before, during and between coaching sessions. It allows us to “see” our own inbuilt distracting habits and rituals around and within a professional context. It also allows us to manage our own emotional detachment as we work with clients. This is especially important when we balance our desire to build empathy with clients against maintaining professional distance. As coaches, we want to be present and open to the client but we should not allow our own perspective or internal experiences or dialogue to cloud the session. Coaches help clients develop their own mindfulness skills and meditations. It can be helpful simply to invite our clients to the practice of taking a simple pause to notice what they are experiencing, and notice that they are more than the immediate running dialogue of thoughts, feelings, and interpretations of the experience. 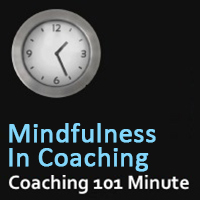 As coaches, our research of mindfulness techniques and strategies can provide options for our personal and professional lives, and fodder for proposed practices or strategies for clients that may lead to more focus on the present and freedom for choice in any moment, as well as more direct and clear communication, less stress, and increased productiveness. Mindfulness is very compatible with coaching’s emphasis on being curious about what motivates us, or what our experiences, thoughts, or feelings may be. Developing this positive curiosity about ourselves and our clients, and assisting our clients to be curious as well about their own experiences and stories, brings a freshness and openness freed from grasping tightly to protected insights or beliefs that may be limiting us or protecting us from enemies that are not real. Mindfulness perspectives and strategies may help coaches and clients move peacefully into new futures. How am I able to help a client re-frame their perspective when she is stuck? Is it possible to “burn out” as a coach?